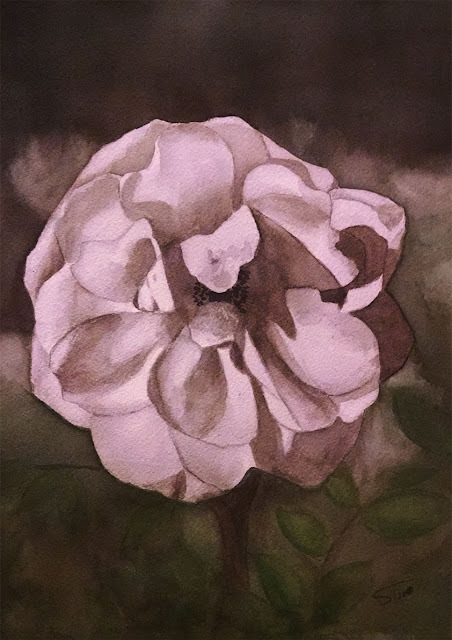 "Acceptance" is a watercolor painting of a white garden rose, historically known to be "the whitest of all white roses", as described by English horticulturist Gertrude Jeckyll. The flower portrayed is a "Blanc Double de Coubert". This rose is a hybrid of Rosa Rugosa, which was introduced in 1893 by Charles Pierre Marie Cochet-Cochet in Coubert, France. It is characterized by its pure white semi-double flowers, its very strong fragrance, and hardiness. The painting illustrates the purity of this rose and its strength. Its curly petals demonstrate acceptance of the harsh surrounding while its character and resilience persist with its brilliant white color.